Below you can find driving directions from Google Maps to help you get from Islamorada to your nearest Fix Apple Now store, situated in Weston. You can either copy the driving instructions below or click here for a larger map and driving directions. We want to help if you've got a broken iPhone 4,5 or 6, iPad, iPod, Apple Mac, MacBook Air, MacBook Pro or Mac Mini in Islamorada. At Fix Apple Now, we have years of experience behind us when it comes to fixing Apple devices, and can bring you the services of some of the market's most experienced engineers. We can deal with all sorts of problems related to Apple devices so talk to us today if you've got a bent iPhone 6 Plus, your incoming call screen won't display, you can hear crackling through your headphones, enlarged icons or images are filling the screen, you have a cracked screen or your device simply won't turn on at all. We can repair your broken Apple device for less. You can contact us at any point if you have any questions about the Apple repair services we offer. 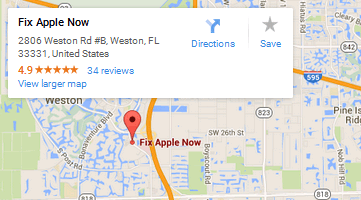 There's simply no need to head anywhere else if you need to repair your iPhone in Islamorada, so call today. Take U.S. 1 N and Ronald Reagan Turnpike to FL-818 W/Griffin Rd in Davie.